6 Fantastic Islay Drams for £25. Phone Lochside Hotel 01496 810 244 if you wish to make reservation for dinner before Tasting. 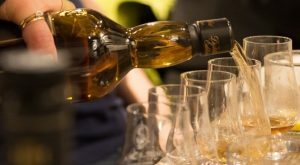 These Islay Whisky Club Tastings are for locals and visitors. So, if you are in Islay on holiday, book your places. We will be delighted to see you. I am hoping that we will have a join session between Kilchoman and Laphroaig, with representatives from both distilleries joining us on the night. Islay Whisky Club is for everyone – old and young (over 18 only) male and female, the expert or the beginner. We are usually at tables at the far end of the conservatory. It will be good to share a dram with you.